Town Meeting voted “to refer the subject of establishing a Juvenile Library to a committee of three.” Rev. Charles Briggs, John Mulliken, Jr. and Ambrose Morell subsequently reported “it is expedient to raise sixty dollars, by a tax, to purchase books for said library.” Town Meeting voted to accept the report and directed the committee to purchase books, establish rules, and oversee the library’s general management. 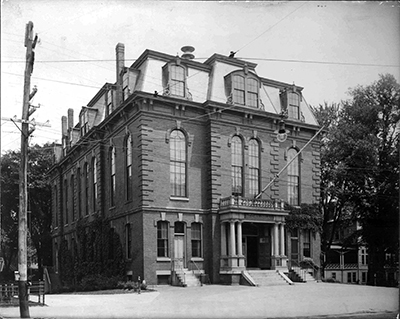 In his Calendar History of Lexington, Edwin B. Worthen states that Lexington’s juvenile library was “the first publicly supported library in Massachusetts, the second in the country” (p. 56). However, several other libraries in New England make convincing claims to be the first (see http://www.sturgislibrary.org/history/oldest-library/) What we can say is that Lexington’s library is one of the oldest in the Commonwealth. A “Sabbath School library” in East Village had 186 volumes. 1867 Twelve citizens formed the Lexington Library Association. Lexington's population more than doubled between 1870 and 1915, to 5,538. Improved access offered by the railroad continued to have a major impact on development: Lexington was being transformed from an isolated agricultural town to a more populated suburb. http://historicsurvey.lexingtonma.gov/lexareas/suburbanization.htm In addition, organizations such as the Masons (1870), Lexington Historical Society (1886), Field and Garden Club (1891), and a number of literary, social, and financial clubs were formed, indicating an increase in leisure time and cultural/educational interests among Lexington residents. “Having a regard for her native place and being prompted by a desire to increase the opportunities for culture among its inhabitants…” With these words Maria Hastings Cary offered the Town of Lexington $1,000 for books if a free public library were established. Mrs. Cary's gift carried with it two stipulations: first, the town was to appropriate $1,000 plus $40 yearly for the purchase of books; second, it was to provide a building, maintain it properly, and keep it open without charge to all the inhabitants. Maria Hastings (1801-1881), after whom Cary Memorial Library is named, was born in 1801, the youngest of nine children. Her father and grandfather, both of whom fought in the Battle of Lexington, were farmers. When she was 27, she married William Harris Cary (1798-1861), whose father, Jonathan Cary, owned a neighboring farm. William and his brother Isaac were wealthy dry goods importers who lived in Boston and New York but spent summers and long visits in Lexington. Maria and William had no children, but Alice Butler Cary (d. 1918), niece of a business partner, was brought up as their own daughter and inherited their property. On April 20, 1868, Mrs. Cary's gift was accepted and the town agreed to appropriate $1,000 when $400 or its equivalent in books was raised. This provision was overwhelmingly met when the Farmers' Club Library agreed to give its collection of books — 401 volumes valued at $575 — to the town. 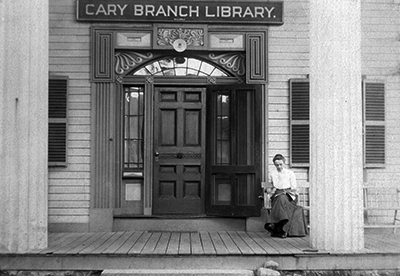 On January 27, 1869, Cary Library opened to the public. Located over Bradford Whitcher's (later Spaulding's) Store, which stood on Main Street (now Massachusetts Avenue) opposite Meriam Street, it was open 1:00-5:00 p.m. on Wednesdays and 1:00-8:00 p.m. on Saturdays. Marian S. Keyes was the first librarian and the 1,200 books, all carefully covered in brown paper, were on shelves accessible only to her. 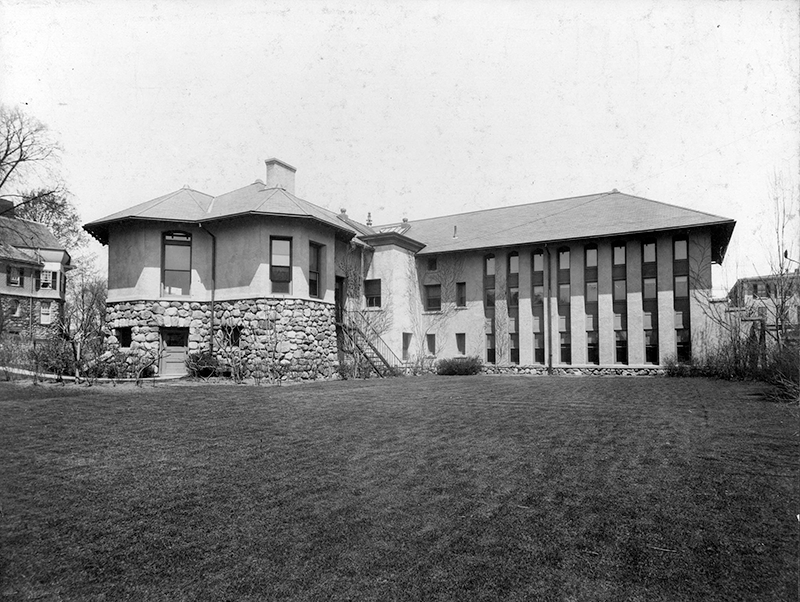 Just one year after the opening of the library, Mrs. Cary proposed constructing a library building. In 1870 a Committee acted on her recommendation and accepted her offer of $20,000 toward building a Town Hall. The library was moved to the first floor of the newly constructed Town Hall, located on Massachusetts Avenue opposite Waltham Street. Until her death in 1881, Mrs. Cary generously supported the library. From 1871 to 1906, Cary Library was housed in the rear of Town Hall. All residents over 14 years of age were allowed to borrow books – but only one at a time. Late fees were 5 cents per day. (Kollen, Lexington, p. 109). 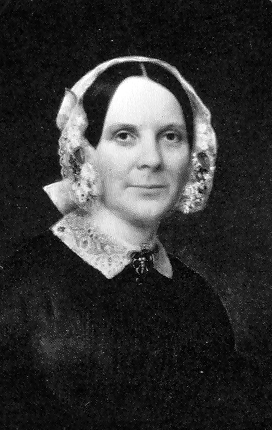 Miss Keyes was succeeded as librarian by Grace S. Wellington. During her term and that of her successor, Florence E. Whitcher, Cary Library continued to expand its collections and services. Maria Hastings Cary died on October 31, 1881, leaving Cary Library $5,000. She was buried in the Green-Wood Cemetery in Brooklyn, New York with her husband, William Harris Cary (who had passed away in 1861). Library service in the community was expanded further with the opening of a Branch Library in East Lexington. 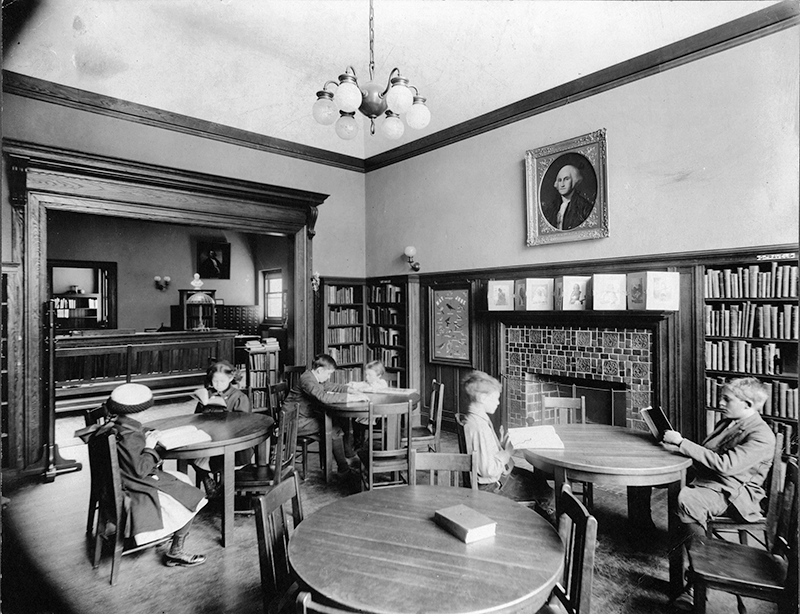 The branch began operation on April 19, 1883 in a reading room of the old Adams School. East Lexington residents could leave their library cards there and receive books from the Main Library twice a week. Miss Nellie Holbrook, the first branch librarian, took the books to and from the Main Library and kept the reading room open "at convenient hours six days of the week." During its first year, the branch had an average of 10 patrons a day. William A. 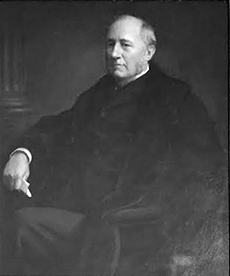 Tower, a successful business man who had served in the House of Representatives and on the Governor’s Council and was most active in town affairs, offered to erect a new library building if the town would provide a site, which he indicated should be at the corner of Clarke Street and Massachusetts Avenue. The town voted unanimously to accept his offer. Immediately thereafter, the Reverend Carlton Staples presented a letter from Miss Alice Butler Cary, foster daughter of Maria Hastings Cary and William Harris Cary, stating that the heirs of the Cary estate offered to provide a site, chosen by town committee, not costing over $10,000. According to the minutes, both communications were received with great applause and cheers and committees were formed to negotiate for the site and to investigate the proposed change in library management. As part of his proposal, Mr. Tower suggested that the Library be run by a “Library Corporation” rather than the existing Trustees (who, by the terms of Mrs. Cary’s original gift, comprised the Selectmen, School Committee and settled ministers). Mr. Tower’s corporation would contain some 30 or 40 citizens as well as the Selectmen and School Committee, but not the ministers. After considerable debate, voter approval, and the involvement of the State legislature, it was left to the Library Trustees to decide whether to relinquish their control. When some of the Trustees resisted Mr. Tower’s plan, the matter was taken to the Massachusetts Supreme Judicial Court, whose bench at the time included the Honorable Oliver Wendell Holmes, Jr. 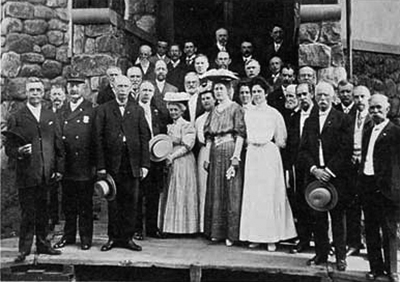 In May 1890, the court decided in favor of maintaining the stipulations of Mrs. Cary’s original gift, and Cary Library’s Board of Trustees has been constructed accordingly ever since. The Stone building was an interesting acquisition for the town. Erected in 1833-34 by Eli Robbins, it was a place where lectures, sermons, and other meetings were held, and where freedom of speech was allowed. Through the years it had been used as a private school, a meeting place for the Unitarian Society led by Charles Follen, and as a lyceum for lectures. Those who had spoken there included Ralph Waldo Emerson, Charles Sumner, Wendell Phillips, Theodore Parker, and Josiah Quincy, Jr. The Main Library was open 2:00 p.m. to 8:00 p.m. Monday-Friday, and 2:00 p.m. to 9:00 p.m. on Saturday. The Juvenile Department was established, allowing children to have free access to 1,800 volumes carefully selected for their interest. 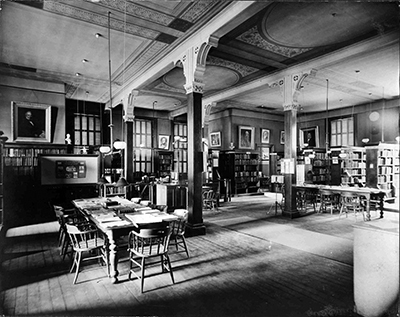 The library moved into new quarters at the corner of Massachusetts Avenue and Clarke Street, where it stands today. The building was the gift of Miss Alice Butler Cary in honor of her foster mother. Originally designed by architect Willard Dalrymple Brown, the building faces the Minuteman Statue and the historic Lexington Battle Green. The small farming community of 2,250 now had a library with 2,617 volumes. In 1915 Lexington’s population stood at 5,538; by 1940 it had grown to 13,113. Equally important but not apparent in the numbers alone is the fact that the town’s population was much more diverse in ethnicity and class than it had been a century, or even 75 years, earlier. 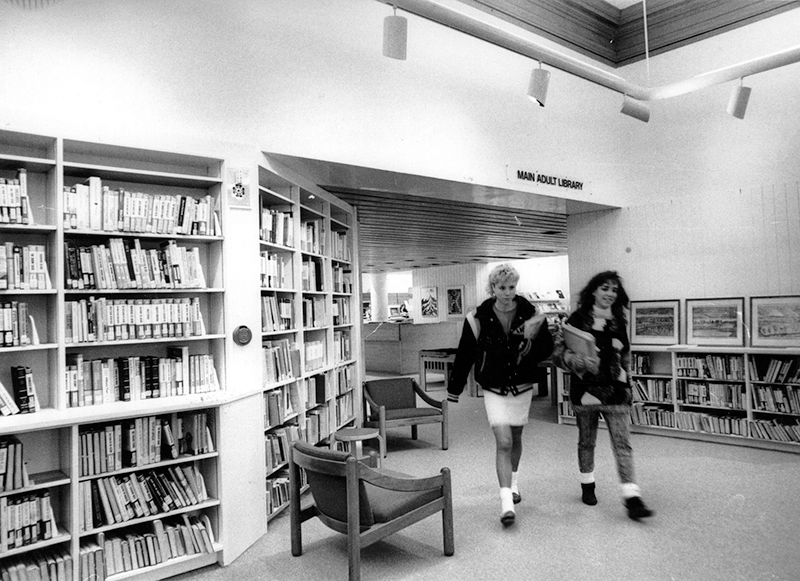 Once in its new quarters, Cary Memorial Library made advances in many areas. Added space made exhibits possible and the Massachusetts Library Art Club provided 17 exhibits of photography in the first year of Cary's operation. In 1909, circulation of 44,079 was almost double the number of books in the library: 22,389 in the Main Library and 2,547 in the Branch. In 1910 a music collection was added through the generous gift of Mrs. Charles C. Goodwin and, in that same year, the Lexington Historical Society transferred its book collection to the library's care. Alice Butler Cary passed away on May 19, 1918. She is buried in Green-Wood Cemetery in Brooklyn, New York near her foster parents, Mariah Hastings Cary and William Harris Cary. 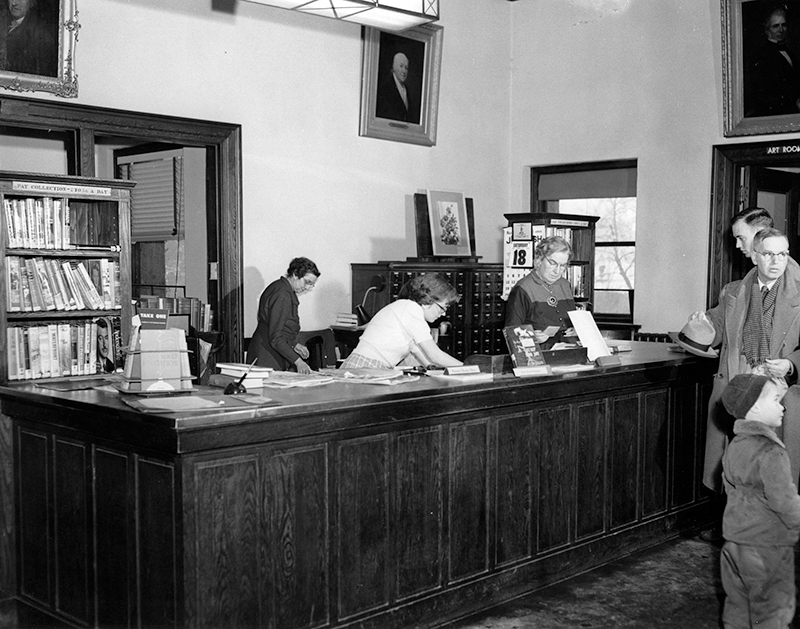 From World War I through the Depression there were few drastic changes in library affairs. 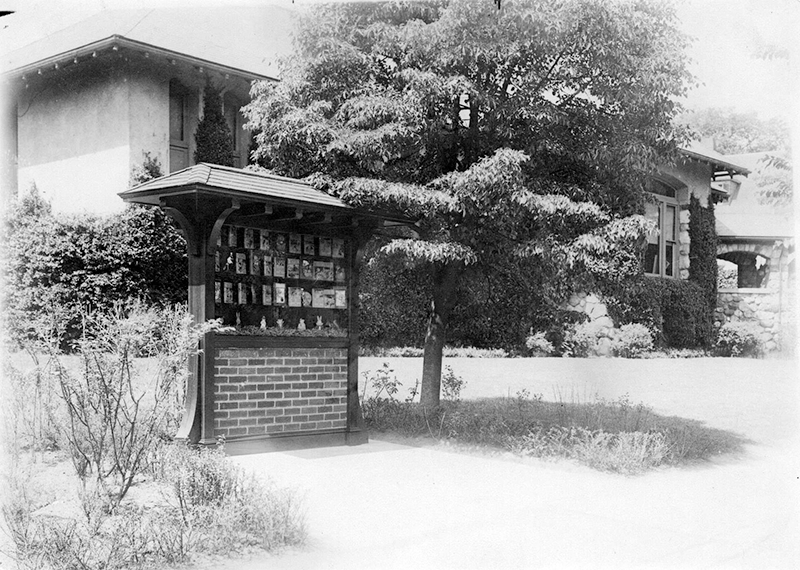 The outdoor bulletin board, a gift from Hallie C. Blake, was set up on Massachusetts Avenue in 1919 and aroused much interest in library circles as a means of educating the public about the many library services. The effect of radio on the reading public was a source of worry in one Trustee's report, but the people of Lexington continued to use the library more than ever before. The Reading Room opened on Sundays from 2:30-6:30 p.m. 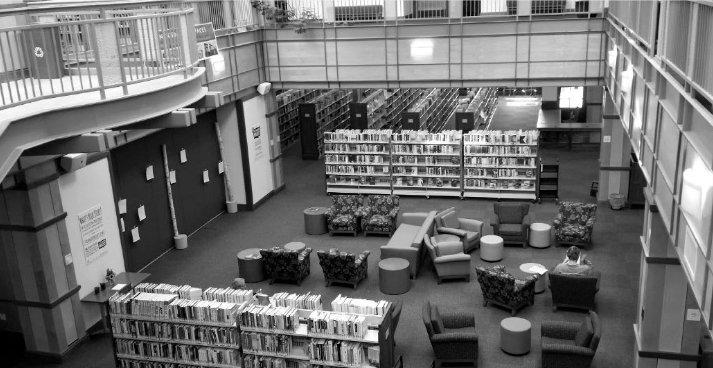 Circulation of 61,830 volumes not only placed Cary Library in the top of per capita circulations in Massachusetts, but also demonstrates the interest of patrons in the library had not diminished, in spite of the attractions of radio and movies. 1939 When Miss Kirkland retired as Librarian in 1939, Ralph A. Nason was appointed to take her place. The mid-20th century brought unprecedented population growth to Lexington. In 1940 the town's population was 13,113. It grew to 17,335 in 1950 and was 27,691 by 1960. Across the country, the end of World War II resulted in a tremendous demand for new housing, because of general population growth and returning veterans eager to start families. Nationally, this culminated in the largest building boom in the country's history, most of which was concentrated in suburbs like Lexington. http://historicsurvey.lexingtonma.gov/lexareas/post_1940_period.htm Population growth resulted in a heightened need for infrastructure improvements throughout town and the construction of a variety of new buildings in the 1960s and 1970s. Once again, the problem facing the library was space, but World War II intervened and it wasn't until 1946 that any changes were authorized. 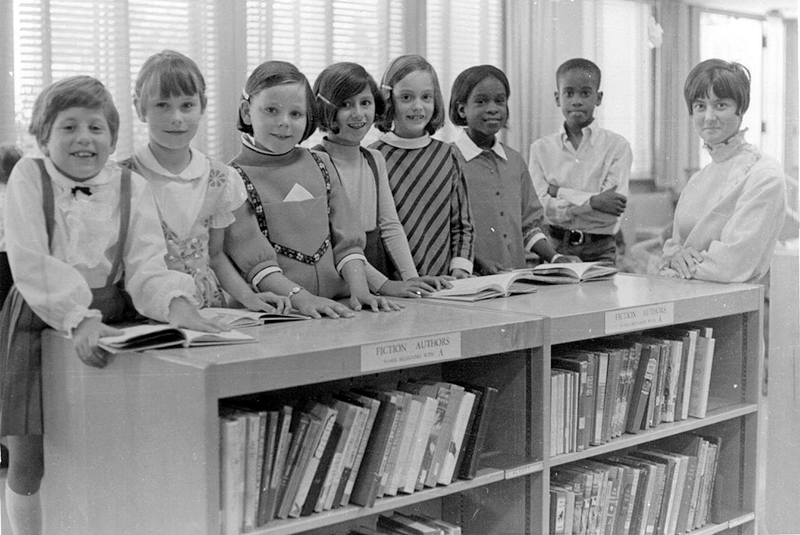 1948 The Main library was remodeled, creating space for a children's area and for 10,000 additional volumes. 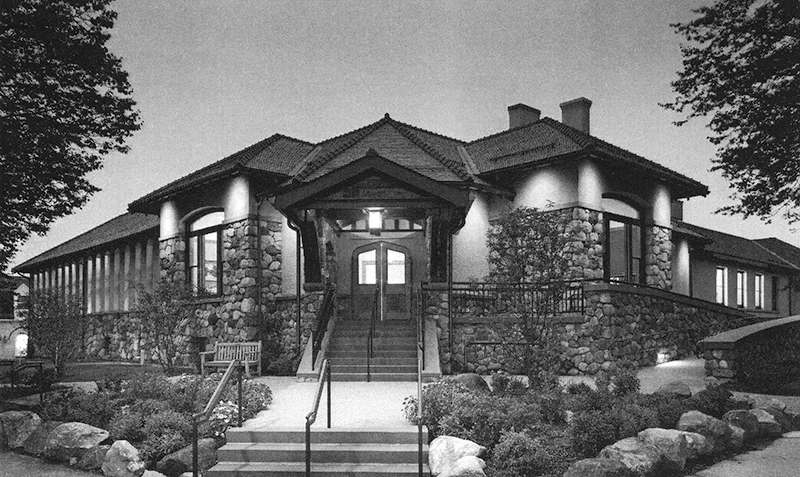 The firm of Kilham, Greeley, Hopkins & Brodie was the architect. 1956 The 50th anniversary of the Cary Memorial Library building was observed in July by an article in the Minuteman newspaper and a display of photographs on the outside bulletin board. 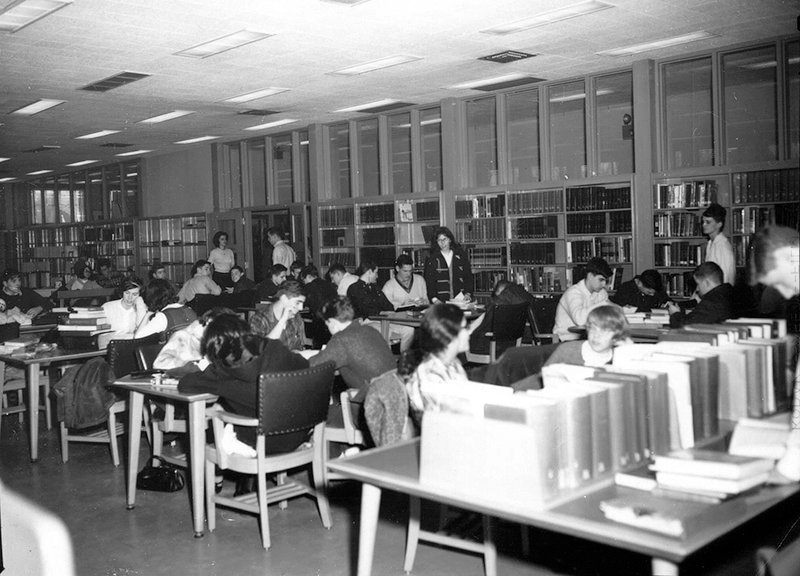 During the 1950s Lexington experienced postwar expansion and once again the library needed more space. 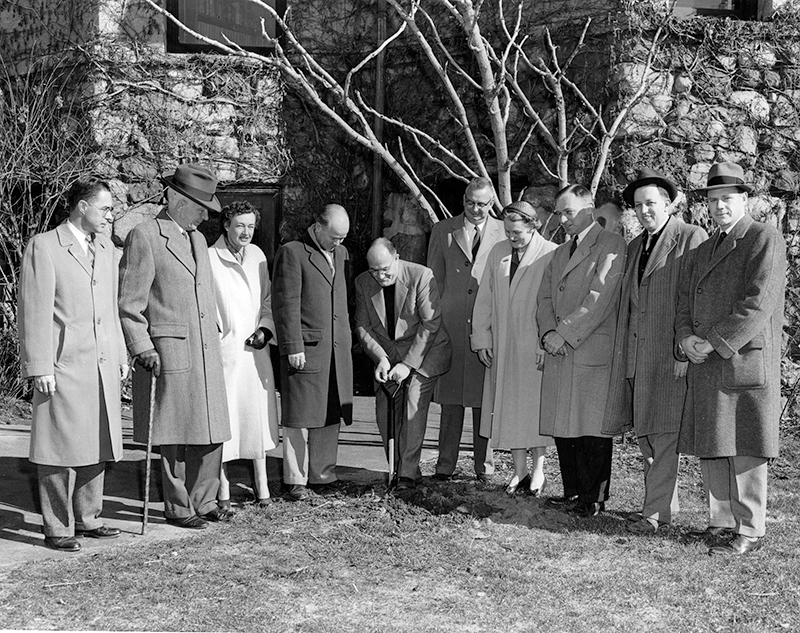 By votes of Town Meeting in 1955 and 1956, an addition to Cary Memorial Library was authorized and ground-breaking ceremonies were held in March of 1957. The project, completed in 1958-1959, involved an addition and renovation of original structure, including the Lexington Room, a reference area and a music/art room. Again Kilham, Hopkins, Greeley & Brodie was selected as architect. Plans were made for programs in the areas of adult education, art exhibits, and film showings. An increased effort in public relations stressed talks to groups, publication of book lists, and newspaper publicity so that the potential of the library would be more fully realized and its position of leadership in the community strengthened. Monthly art exhibits became a regular feature. At the same time, the library established an original print collection, including the works of about 50 local American artists, which allowed patrons to rent prints for use in their homes or offices. Cary Library was among the first public libraries to circulate original prints. 1963 A film, "The Fifth Freedom," was made at the Cary Memorial Library under Mr. Nyren's guidance. 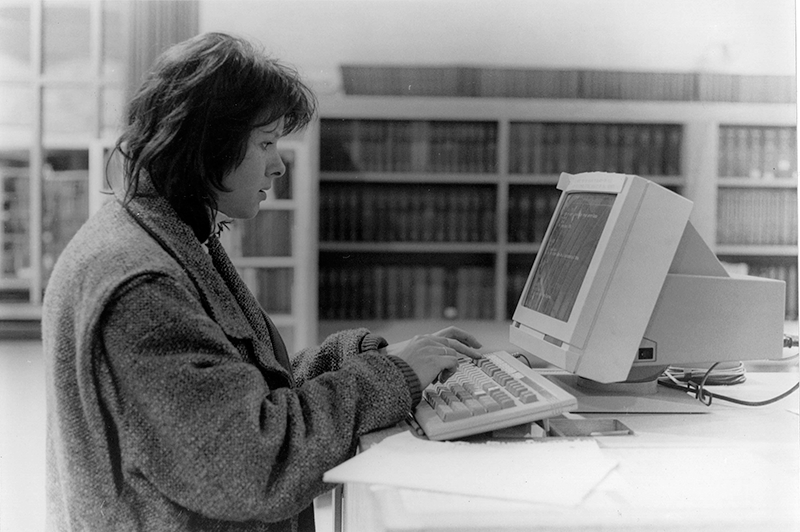 The film explained the operation of a medium-sized library with emphasis on the essentials of good library services; its purpose was to encourage people to exercise their freedom to read. "With the demand among adults for less fiction and more non-fiction, Cary Library concentrated on the acquisition of materials especially in the areas of business and science, often aided by donations from local businesses and individuals. Mr. Nyren implemented a book selection policy, placing emphasis on the individual's freedom to make his or her own choice of books, and putting the responsibility of children's reading in the hands of parents. 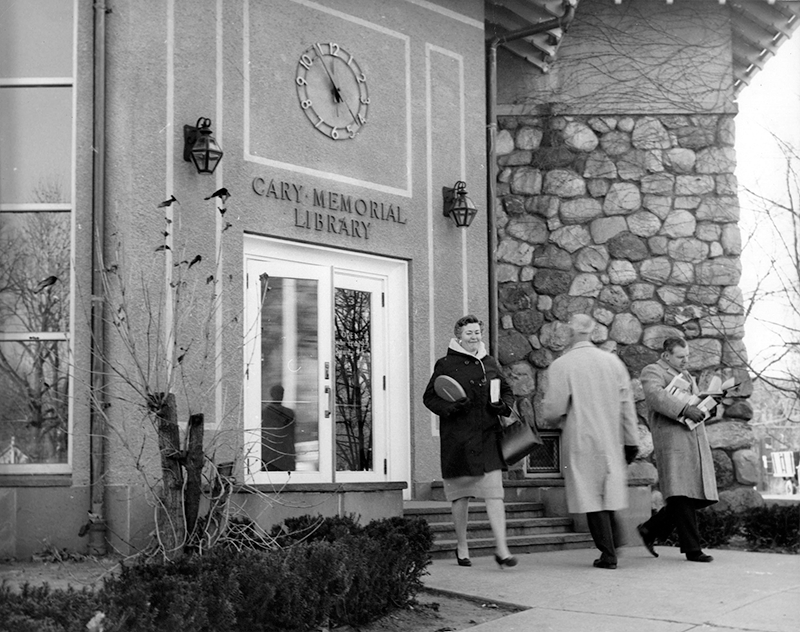 1967 Robert C. Hilton succeeded Karl Nyren as Director, and it was under his tenure that the first century of Cary Memorial Library ended and the second 100 years began. On its 100th anniversary, Cary Memorial Library’s book circulation alone (437,177) was about 10 percent higher than the previous year. The need for a renovation and expansion was identified as urgent. New library services included: initiation of Sunday afternoon hours, creation of a Lions Club-sponsored Large Type collection, and development of a paperback collection. The centennial celebration began with a 100th birthday party for children, and included special exhibits, a lecture series, a reading by poet and librarian Archibald MacLeish, and an open house reception for Lexington authors. Based on increased usage of the library, the Permanent Building Committee worked with the Architect’s Design Group of Cambridge on preliminary plans for a complete renovation and expansion program. The Board of Trustees recommended a plan for phasing of construction in two steps: the first phase provided for 13,000 s.f. of new space and necessary renovation of 25,000 square feet in the existing structure, resulting in additional staff work area, increased book and reader space, a new heating system, total air conditioning, a story room for children, additional Lexington Room space, and upgraded building systems to meet fire protection and accessibility standards. The design of the first phase would facilitate a later addition of about 10,000 square feet, if and when needed. An advantage of a phased approach was that it allowed a reevaluation of actual space requirements at a future date. Funds for final plans for the first phase were requested at the 1972 Town Meeting. The request for construction funds were made in 1973, and the building was completed in 1975. 1978 Cary Library was active in three library networks: Eastern Regional Public Library System, Wellesley-Lexington Areas Cooperating Libraries, and Community Health Information Network. 1980 Cary Library joined NELINET, a regional network of libraries that shared costs, resources and cataloging, allowing access to materials worldwide through the Ohio Computer Library Center (OCLC). 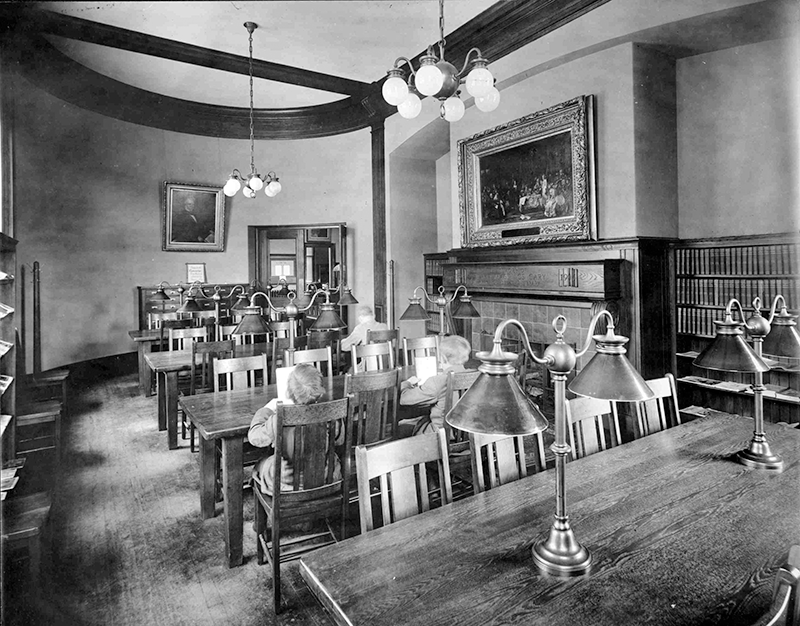 A Main Library building renovation included additional shelving and improvements in office space, fire protection and handicapped access, as well as HVAC improvements, and painting and renovation of the original 1906 lobby. The Architect was Davies and Bibbins. 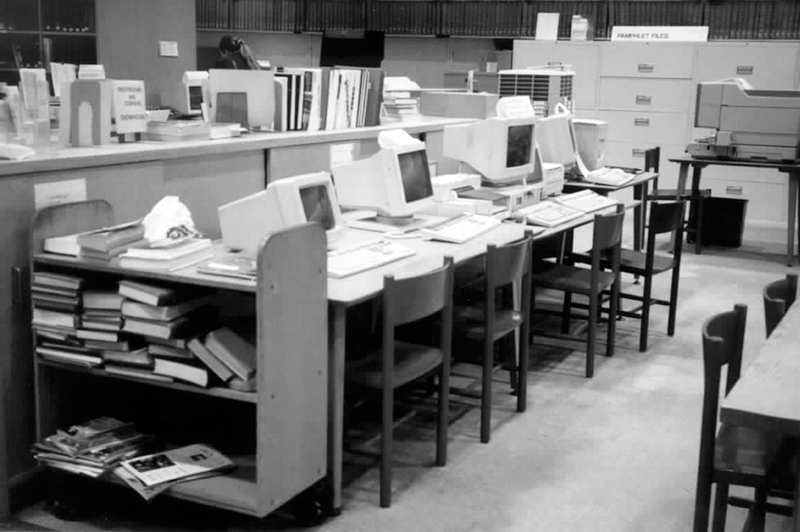 New technologies included telefax and electronic mail, allowing staff to share information with other libraries; and installation of a user-friendly online catalog for public use. Cary Library joined the Metro-Boston Library Network (MBLN), an integrated and computerized network of the public libraries in Boston, Brookline, Cambridge, Chelsea, Lexington, Malden and Newton. The Library Trustees asked its Advisory Committee and staff to develop a new long-range plan focused on facilities, staffing and technology. The expansion program designed 20 years ago was reexamined and a financial plan for capital fund-raising was considered. 1991 A new long-range plan was approved by the Trustees. 1995 Director Robert Hilton retired. Shortly after the arrival of Carol Mahoney as the new Director, plans for a third building renovation got underway. 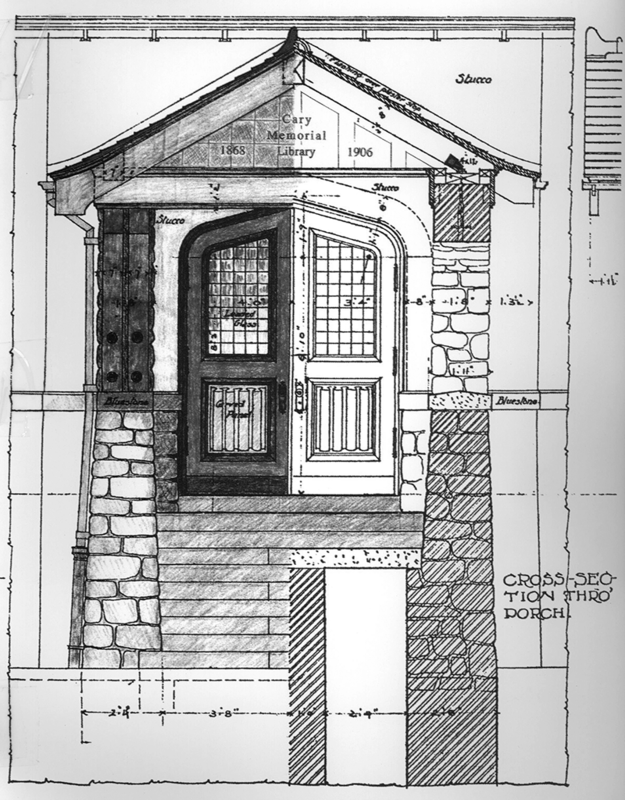 The Town's Permanent Building Committee selected architect Stephen Hale and Associates to develop schematic designs. 1996 Cary Library submitted an application to the Massachusetts Board of Library Commissioners for a state grant to finance one-third of the proposed $7 million renovation/addition project. The application was rejected in September. Cary Library was not alone: only 38 of 92 applications for construction grants were funded by the Board. 1997 Cary Library’s new application for a $2.86 million construction grant was accepted with Stephen Hale and Associates architects for the project, and construction anticipated to begin in 1998. The library’s entire operation would be relocated to Cary Hall during construction, with all but current materials moved to the East Branch or put in storage. 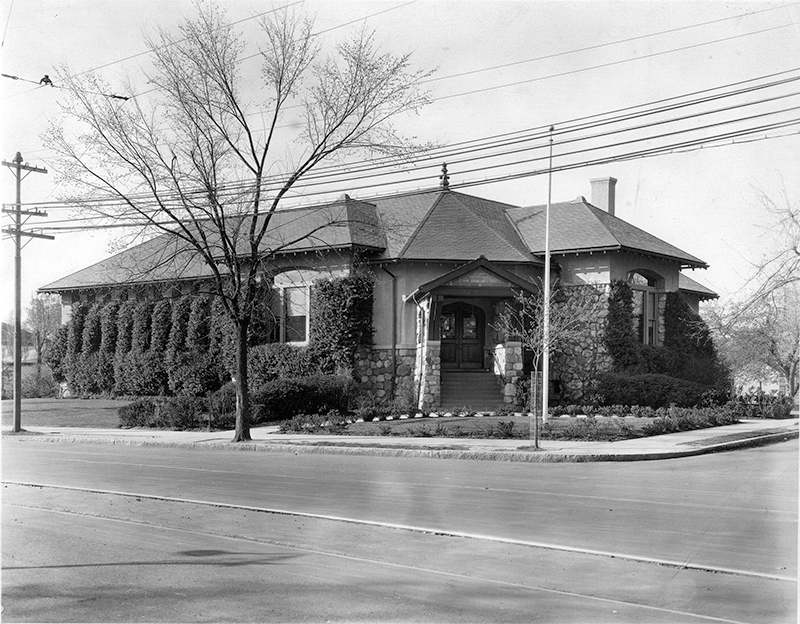 On its 130th birthday, Cary Library was considered to be the gateway to information for the community. 10 new public computers were available to the public for accessing the Internet, the library catalog and other information databases. Anniversary celebrations included a reception honoring more than 200 librarians who lived or worked in Lexington. Cary Library, along with Newton, Cambridge and Brookline, joined the Minuteman Library Network. The Library Building Project was suspended after an abutter appealed the variances approved by the Board of Appeals. The renovation/addition project was put on hold while the Library Building Committee reconsidered the plans. 1999 A lawsuit filed by an abutter was resolved, although plans for the renovation still had to be approved by the Historic Districts Commission. Construction was scheduled to begin in 2000. The Main library moved to Cary Hall for the duration of construction and the East Branch increased hours to offer more services. 2000 Cary Library launched its new website, www.carylibrary.org. 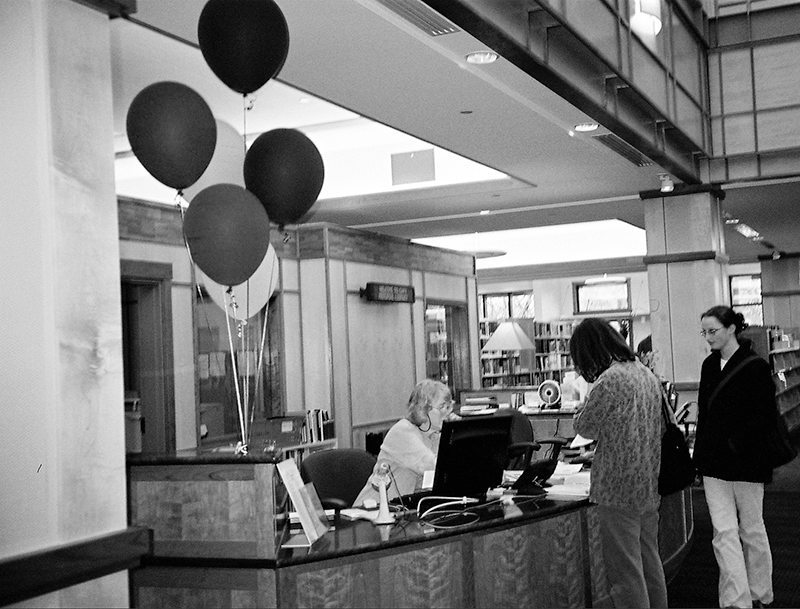 After 11 weeks of preparing Cary Hall, Cary Memorial Library opened the doors to its temporary home on January 22, 2001. In June, the Town signed a contract with Alexandra Construction of Newton; a ground-breaking ceremony was held on June 28, followed by demolition and construction. The new library was scheduled to open Spring 2003. Implementation of a Windows 2000 Local Area Network (LAN) enhanced staff efficiency as well as file security and access. The library’s website was invaluable in keeping the community informed about construction progress. DVDs and graphic novels were very popular new formats. Children’s Room staff assisted the Foundation in celebrating Maria Hastings Cary’s 200th birthday with a party on the lawn in front of Cary Hall. The American Library Association named Cary Memorial Library as one of the Great American Public Libraries, ranked 6th in its population group. A significant collection of Chinese language books, among the largest in the state, was cataloged. Cary Library debuted AskUs, an e-mail reference service. A number of issues, including an extremely cold winter, delayed the completion of Cary Library and the move from Cary Hall. The good news was that the construction budget was not adversely affected. 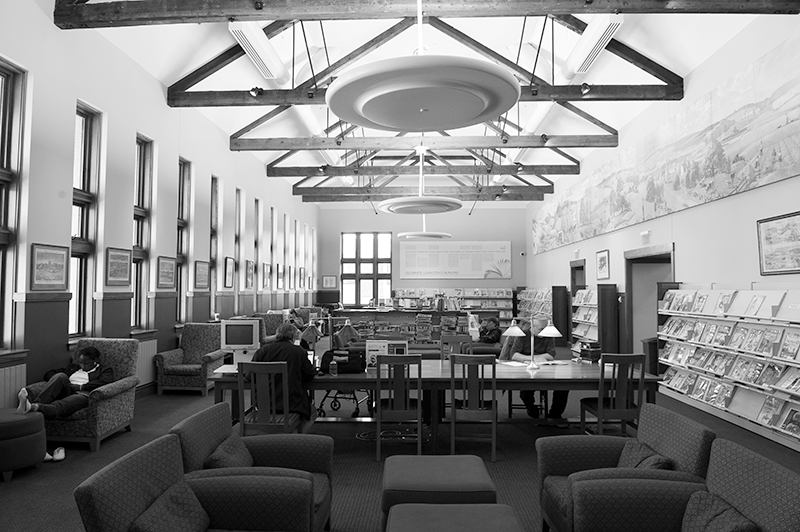 On April 20, 2004, the restored and renovated library opened, featuring enhanced public service space, a Children's Room nearly tripled in size, state-of–the-art technology and systems, two large meeting rooms, and five private study rooms. The main entrance and locl history rooms were restored to the original 1906 design of Willard D. Brown, and the new addition reflects his Arts and Crafts influence. 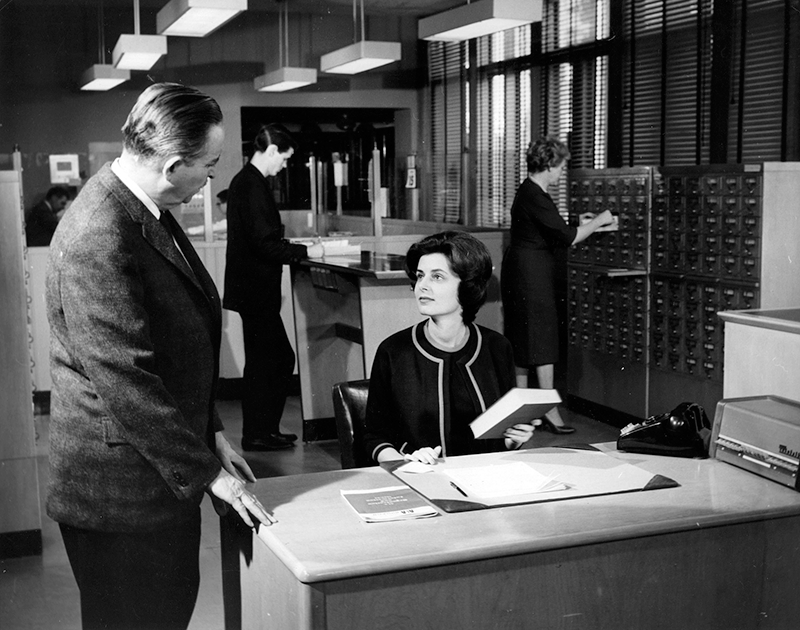 Improvements were made to the building (windows, lighting, sprinklers, elevators, restrooms), to technology systems (telephones, computers and networks, wifi), to staff spaces (service desks) and to public amenities (pcs, printing/copying, study rooms). A separate Children’s Room on the lower level included a story time room, and reading and play spaces. 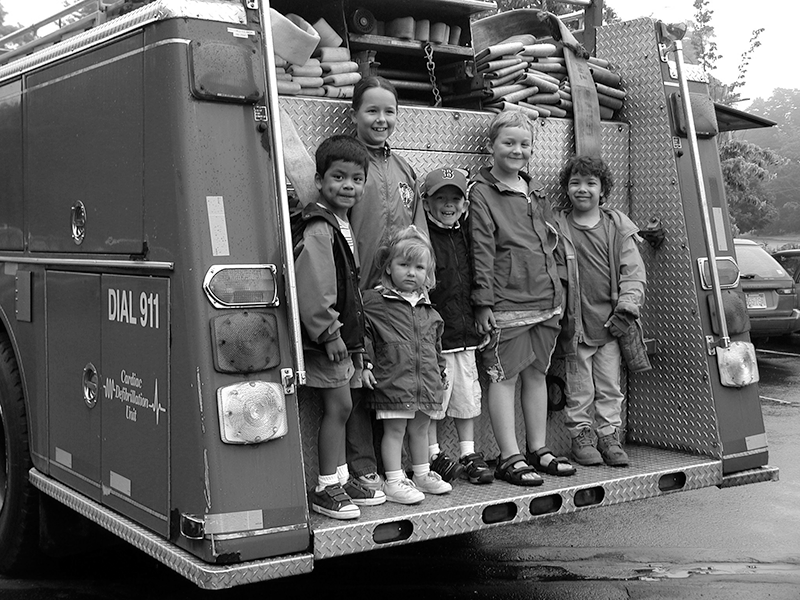 During the first 11 months of 2004, Children’s staff offered 173 programs that were attended by over 10,000 participants. The renovation made it possible to offer Teens their own space on the Main floor, specifically designed for grades 6-12, near the Reference Desk. The challenge was to attract them to the library. To that end, Cary Library staff developed Teen programs in collaboration with the schools and a newly formed Teen Advisory Board (TAB), with seed money donated by Lexington resident Ashley Rooney. Teen-focused collections were expanded; donations were made for a “Teen Issues” section (by Ms. Rooney) and purchase of high school AP text books (by The Cary Library Foundation). Word of mouth encouraged more teens to join their peers at Cary Library. Carol Mahoney retired as Library Director after overseeing the 9-year building project. Connie Rawson, former Assistant Director, was appointed Acting Director while she continued to serve as the Town’s MIS Coordinator. Due to the failure of the FY04 override, all Town departments decreased their budgets, resulting in library staff layoffs. Cary Library lost 17 positions. 322,952 items from the Adult collections were circulated, an increase of 23 percent. The Lexington Lions’ Club donated funds to purchase hardware and software that allow vision-impaired patrons to read library materials more easily. New technology installed in the Large Meeting room allowed use of laptop internet connection with an integrated projector/screen, microphones, assistive listening devices and video/DVD player. The equipment was used during 133 meetings or events. A new mystery book group was formed, called “Death by the Book,” boasting over 20 members. The Teen Advisory Board (TAB) included 38 members ranging in age from 13 to 18. Cary Library initiated “Lexington Reads,” an annual program similar to “One Community/One Book,” which encourages the entire community to read the same book and attend theme-related events. The first book was The Future of Life: Biodiversity in the New Millenium, by Lexington resident Edward O. Wilson. Professor Wilson inaugurated the first "Lexington Reads" with a lecture at Cary Hall on January 9, followed by a number of programs and discussion groups from January through April. The final event was a talk by environmentalist Bill McKibben on April 16 at the Hancock Church. From that beginning, "Lexington Reads" created an opportunity to engage residents, foster a sense of community, and promote a culture of reading and discussion on a broad range of topics. In 2006, two books were selected: The Namesake by Jhumpa Lahiri, which was read in the fall, and Paul Revere’s Ride which was the selection for spring. In 2007, poetry was chosen as an overall theme for Lexington Reads; a highlight of this series was an evening of community poetry reading hosted by Lexington’s own poet, X. J. Kennedy. Young Adult programming continued to grow and expand with the introduction of Dance Dance Revolution and continuation of the Halloween Ball, Tales told by Teens, and author visits. More than 14,000 participated in 314 Children’s programs. The Art Selection Committee began monthly displays of art in the Piper Gallery, Pierce Gallery and Large Meeting Room Gallery. Comcast donated a cable modem to the library, increasing available bandwidth and speed to patrons using the Internet. CML achieved certification status for FY2007 and was eligible to receive the entire amount of state aid ($42,330). The East Lexington Branch Library was closed to the public on August 21, 2007 after a serious flooding problem. A decision was made by the Trustees on September 18, 2007 to keep the Branch closed. Cary Library initiated an expanded Adult programming initiative under the guidance of new Reference/ Programs librarians. Established in 2002, Cary Library’s Door-to-Door program averaged 20.5 deliveries per month to home-bound patrons. In total, there were 246 deliveries, a 23 percent increase over the previous year. The Teen Advisory Board began its fifth year. Circulation of Young Adult books increased 22 percent from 2007. Wireless internet access continued to be a very popular service. In fact, Cary Library was the only free wireless access provider in Lexington Center. 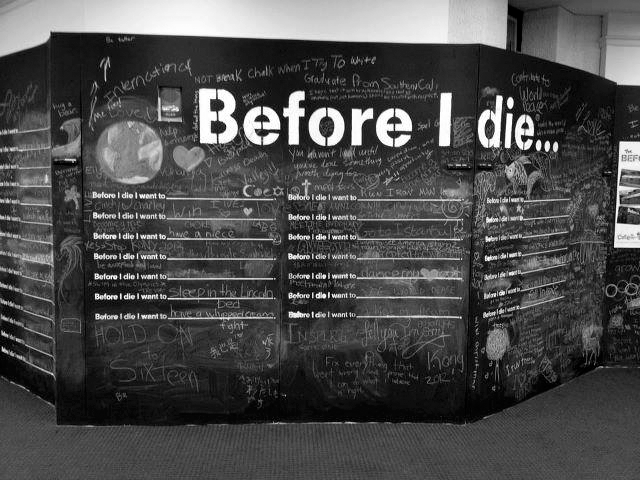 In 2012, the wildly popular and moving “Before I Die” wall drew participation from every demographic group. This was the impetus for creating a space on the Main Floor in 2016, called the “Idea Wall,” dedicated to collaborative interactive art and inviting people to share their creativity with the larger community. The ongoing Science Café (2014) routinely brings in large crowds, and a visit from a Pluto scientist (2015) drew over 200 people all ages. Similarly, "Meet the Robot" visits with the Lexington High School robotics team have brought hundreds of people into the library. Collaboration with Lexington residents started new programs like the Socrates Café (2016), which provided a space for civil, thoughtful discussion among members of the community. Cary Library applied for and received a grant from the Massachusetts Board of Library Commissioners for a preservation survey of the library’s local history materials. A Preservation Action Plan outlined the environmental and physical factors that impact the library’s special collections. A burst pipe over the Large Print collection caused damage to some materials, but paved the way for that area to become Cary Commons the following year. A Donor Wall, designed by Alice Hecht, was installed in the lobby to recognize those who generously contributed to the library’s 1999-2004 Building Campaign. 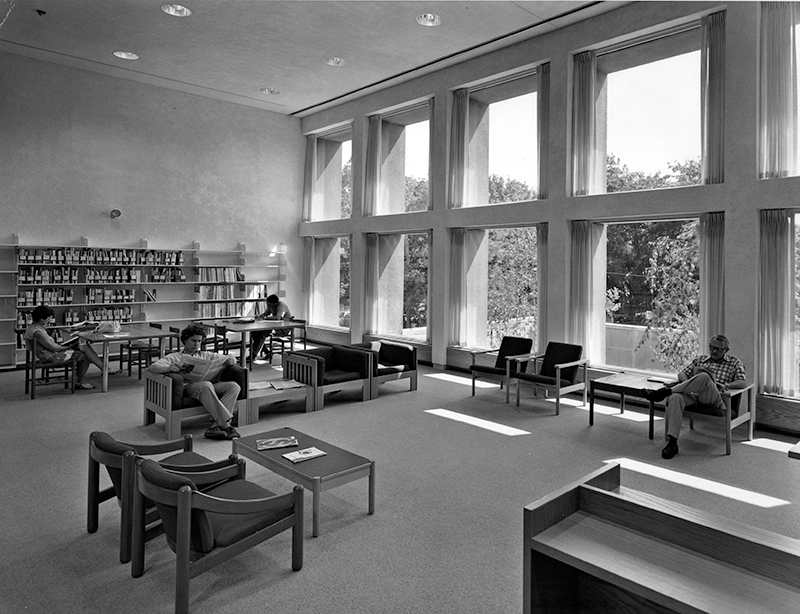 Patrons used the library’s five quiet study rooms 4,972 times, up 17 percent from the previous year. Connie Rawson retired after serving the Town of Lexington since 1996 as Assistant Library Director (1996-1999, Director of MIS (1999-2005), and Library Director (2005-2011). After an extensive national search, Koren Stembridge was appointed Director. Cary Library added hundreds of downloadable e-books and e-audiobooks to the collection, making Lexington rank fifth in e-book circulation among all Minuteman Library Network libraries. The October snowstorm and power failure brought record numbers of patrons to the library, looking for light, heat and power to recharge their phones and other devices. The highest number of reference questions ever were logged. 2012 Two new Teen programs were added: a middle school book club and the first-ever Teen Summer Reading program. 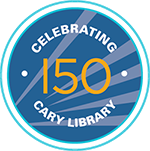 As the Town of Lexington prepared to celebrate its 300th anniversary of incorporation, Cary Library undertook a year-long process to develop a 2014-2017 Strategic Plan, accepted at the May 22, 2013 Board of Trustees meeting http://www.carylibrary.org/strategic-plan. The plan guided the library’s growth during a time of fast-paced change in the publishing, information, and entertainment industries, where digital, downloadable and streaming technologies bring content directly to the consumer. At the same time, public libraries remain one of the few places where information is made freely accessible to all, and where individual privacy is protected. Cary Library participated in the Town’s 300th anniversary celebration by promoting the Lexington Author Collection, and presenting author Jill Lepore who talked about her book The Story of America. In addition, the library hosted a juried art show and sale: “A Community Creates,” March 1-31. The month-long exhibit at Cary Memorial Library presented works by 25 artists working in a range of media from watercolor and oils to collage, photography and lino-cuts. Cary Library unveiled a redesigned web site www.carylibrary.org. In addition to Summer Reading programs for children and teens, Cary Library initiated an Adult Summer Reading Program, encouraging the public to Read a Book, Write a Review, Win a Prize. Cary Library’s “Year of Discovery: science, technology and you” provided new ways to work with community members. Partners included LexFarm, Kids Cooking Green, Einstein’s Workshop, and Across Lexington. Cary Library received a grant from the Dana Foundation for $10,000 to support library collections of interest to senior citizens. “Dumbledore’s Army” was formed. This middle school advisory group is one of several ways in which Cary Library is committed to engaging this age group and bridging any gaps in service between the Children’s and Teen departments. The Children’s Department hosted its first-ever “Fairy Tale Ball.” More than 500 children and their families enjoyed dancing, crafts and other activities. Cary Library is the sixth busiest library in Massachusetts after the much larger Boston, Cambridge, Newton, Brookline and Worcester libraries. On the Main Floor, the library features four new study rooms (for a total of seven), a “Library of Things” collection, enhanced user technology, prominent World Languages and Adult Fiction collections, a multi-use living room/community gathering area, an Idea Wall for interactive exhibits, and a new Main Desk with RFID self-checkout stations and enhanced Circulation and Reference services. The New Fiction, Large Print, Fiction, Mystery and Science Fiction collections are located near each other for easy browsing. 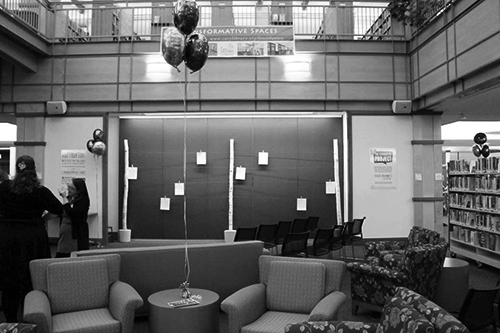 Cary Commons is a casual gathering space as well as the location of the Gallery for Student Art, Friends Bookstore, community materials, and public computers. On the Lower Level, a sparkling new Teen Space offers creative, study and technology areas for grades 6-12. http://anyflip.com/hkxz/rspm/ Between 2004 and 2015, Teen programming, collections and services had expanded significantly; by 2012, seating in the Teen area was doubled from 15 to 30. The new Teen space has seating for more than 60 and includes collaborative workspaces, lounge area, computer tables, and the Young Adult fiction collection. In accordance with the provision of the gift of Maria Cary establishing a public library in Lexington, the Board of Library Trustees consists of "the Selectmen, and the School Committee of the Town for the time being, and the settled ministers of the place." The Board of Library Trustees oversees the financial affairs, trust funds and fundraising activities, and sets the policy for the operation of the Library. The Trustees elect a five-member Executive Committee to oversee the financial and day-to-day operations of the Library. The Executive Committee consists of two officers of the Board of Library Trustees and three other Trustees. The Clergy, the Selectmen and the School Committee have at least one representative on the Committee. The Executive Committee has full power to act in all matters for the Board of Trustees. 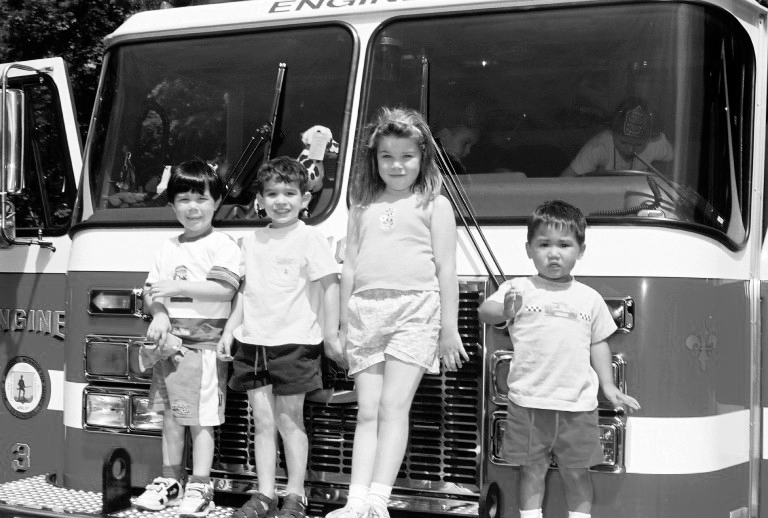 In 1999, Cary Library’s Board of Trustees created the Cary Memorial Library Foundation as the official organization for accepting donations to Cary Library. The Foundation enables every Lexington citizen to be both a stakeholder and a steward of Cary Library. Each of us can ensure that future generations will benefit from our generosity, just as we have benefited from the foresight of the Cary family. The Foundation’s first act was to raise $4.2 million toward the $15 million Library building renovation that was completed in 2004. Since 2009, the Foundation has raised $1.5 million to support the Library’s collections, to launch new programs, and to upgrade the Library’s technology and physical environment. 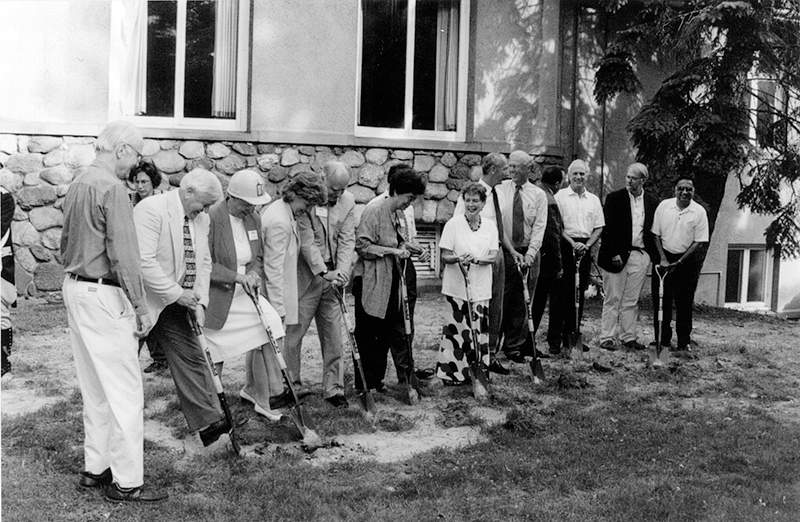 Thanks to the vision and generosity of its donors, the Foundation has been transforming Cary Library in ways great and small since 1999. 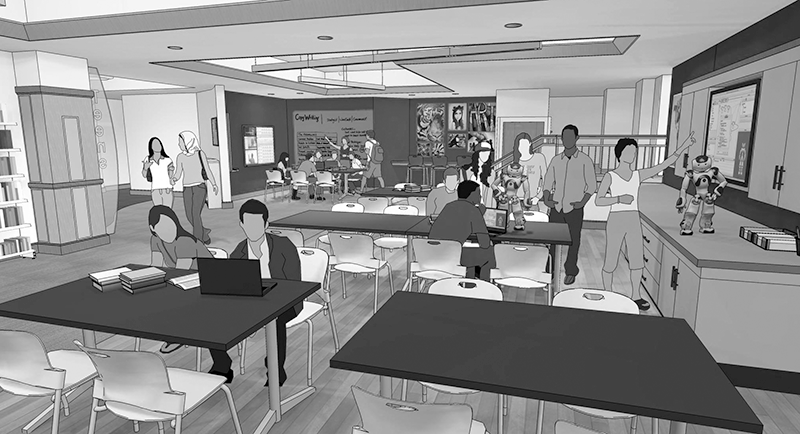 $750,000 raised for Transformative Spaces, a 2016 construction project offering a new Teen Space, more study rooms, atrium gathering area, Idea Wall, Library of Things, enhanced technology, readily accessible Adult Fiction and World Languages Collections, and better customer service. $1.5 million raised since 2009 for books, music, films, programs, welcoming spaces, and new technology, like iPads for the Children’s Room. $52,385 grant from Shire for the 2014 Large Meeting Room lighting and technology upgrade. $23,000 for Cary Commons, the community gathering spot on the Main Level. 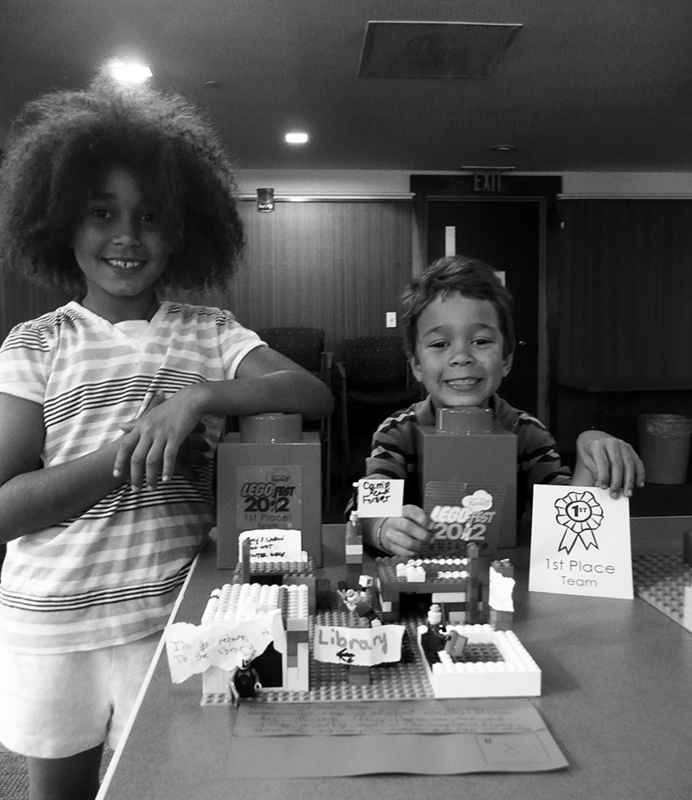 $5,000 raised through crowdfunding for educational toys for the Children’s Room (2014). $57,983 since 2009 for Lexington Reads, the annual community reading of one outstanding work of fiction or nonfiction, celebrated with a month of programs and activities. The 2014 Year of Discovery, the year-long exploration of how science and technology is changing our lives--co-created with the Lexington community. Science Cafe, a series of community encounters with local scientists. The Fairy Tale Ball, a magical costume ball for all ages. Cooks & Books, Fuel Your Mind, and other community events to support Cary Library. Development and launch of the new Library website. $4.2 million raised for the $15 million Library building renovation completed in 2004. The Friends of Cary Memorial Library, Inc., is a 501(c)(3) nonprofit organization dedicated to supplementing and enhancing library services, as well as advocating for the library and its users. We are also a part of the Massachusetts Friends of Libraries (MFOL), a networking, advocacy, and educational organization that lobbies elected officials for library support throughout the Commonwealth. A calendar history of Lexington, Massachusetts, 1620-1946, issued by the Lexington Savings Bank in observance of its seventy-fifth anniversary, 1871-1946 [Worthen, Edwin B.]. Lexington MA: The Bank, 1946. History of the town of Lexington, Middlesex county, Massachusetts: from its first settlement to 1868, by Charles Hudson. Rev. and continued to 1912 by the Lexington Historical Society. Boston MA: Houghton Mifflin Company, 1913. See especially pages 405-410. Tracing the past in Lexington, Massachusetts, Edwin B. Worthen. New York: Vantage Press, 1998. See Chapter on “The Cary Family and their Benefactions,” especially pages 146-148. Lexington: from liberty’s birthplace to progressive suburb, Richard Kollen. Arcadia Publishing, 2004. Report of the Auditors of Accounts against the Town of Lexington for the year... Lexington (Mass. ): George C. Rand, Printer, 1857 – present. [Collection of articles, brochures and publications on the history of Cary Memorial Library, Lexington, Mass. / compiled by the staff of the Cary Memorial Library, Lexington].